Ingrid Cotton is an experienced, innovative real estate salesperson who enjoys working along the stunning Bay of Plenty coastal strip. 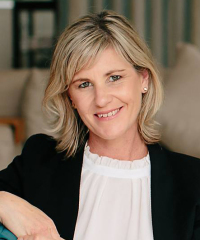 Many years in the interior design and construction business and her track record as an award-winning interior and lighting designer gives Ingrid a useful understanding of the building industry and property presentation. Her capacity to get a deal over the line and her strong ethics bring a clarity and certainty to the process of marketing and negotiating the sale of property. Ingrid has quickly made a name for herself with a particular focus on apartment living and high-end luxury coastal property in the Bay of Plenty. Recently she secured a record price for a Papamoa property and then secured an unprecedented beachfront sale that broke further records. She loves to match clients to property and she does this by listening to them and responding to their needs. She calls on her interior design skills when clients need guidance on ways to get their home ready for the market, ensuring their property stands out amongst others. Outside of real estate Ingrid can be found in her rare spare time with her family and walking her dog Snoop on the beach. A lover of art and design, skiing and scuba diving, sheâ€™s also a passionate supporter of many charities.